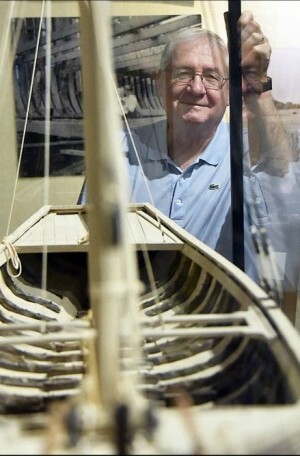 Archaeologists who worked to raise the Brown’s Ferry Vessel from the Black River and display it at the Rice Museum in Georgetown admit it now: Their model is not accurate. The cargo ship had a transom and an aft deck that was overlooked until experts reassembled its remains on the third floor of the Rice Museum in 1992 and changed their opinion of how the vessel looked. 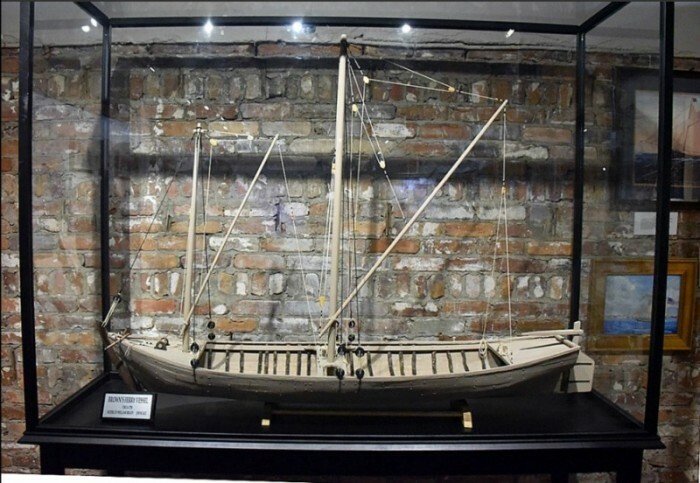 A new model of the oldest commercial vessel recovered in the southeastern United States will go on public display Saturday at the South Carolina Maritime Museum on Front Street, Georgetown. William Brady of Litchfield Country Club built the model using plans drawn by yacht designer Ed Scott of Georgetown. Brady, Scott and museum board member Mac McAlister began talking about building a new model of the Brown’s Ferry Vessel more than a year ago. Their meeting at the Rice Museum to look over the vessel’s hull proved to be a confluence of unique talents. Scott, formerly director of the boat school in Eastport, Maine, and his wife, Pat, had recently moved to Georgetown when the school closed. Brady, an Air Force retiree and model builder, moved to Litchfield with his wife, Yolanda, just a few years ago. McAlister and his wife, Mary, settled in McClellanville after sailing the world’s oceans. All have an interest in history and were intrigued by the challenge of bringing a display of Brown’s Ferry Vessel to the museum. Steffy made a model of the vessel, showing it as double-ended. When his protege, Frederick Hocker, came to Georgetown to view the reassembling of the wooden ship after it had spent 20 years in water and anti-freeze being preserved, he saw that Steffy had misinterpreted the stern because so much of it was missing. Hocker was a boatbuilder from Mystic Seaport, Conn., and had experience that Steffy did not, Scott said. When Hocker explained his findings, Steffy agreed. When Scott found Hocker’s drawings of the ship with a transom, he e-mailed him at the maritime museum in Stockholm and they discussed theories. Because the ship had a windlass, Scott knew it had a forward deck. He drew a detailed set of full-sized plans for the 50-foot ship and turned them over to Brady. Brady spent 350 hours building the 1/10 scale model from the same wood as the original: oak, cypress and pine. The size, he said, made this his most ambitious project ever. The original ship had a wide flat bottom that let it slide onto banks where there were no wharves or piers in the early 1700s. Because the original ship was constructed of thick boards, the scale model presented a challenge. Brady said he soaked the cap rails in water for four days so he could bend them into shape. The vessel contained a lot of nails, and Brady made his own using upholstery tacks. He made the blocks, anchors, windlass and dead eyes from wood. He made everything except the anchor chains and the rigging cordage. An amateur diver, Hampton Shuping, discovered the ship in 20 feet of water under the mud near the Brown’s Ferry landing in 1973. The wreck was lying at an angle against the bank, evenly spaced pieces of wood sticking out of the mud, he said. He found a quadrant used for ocean navigating and dug up wine bottles, cups and bowls. State archeologists showed no interest in the find until 1976. He borrowed a crane from International Paper and fashioned a lift using tie-down straps from the Charleston Air Force Base.“We were too dumb to know it couldn’t be done,” he said. There were 8,000 people on the banks of the Black River when the ship was raised out of the water. They sang “Shall We Gather By The River” while they waited, Wilbanks said. The ship was lifted onto a flatbed tractor trailer and hauled to Front Street in Georgetown. Sprinkers kept the wood wet while it was on display. Wilbanks drove it to Columbia, stopping every 10 miles or so to ask a gas station attendant if he could borrow his hose pipe. Eventually, the ship was placed in water to prevent further deterioration. From 1977 to 1983 it was maintained in a farm pond before being moved to the Institute of Archaeology and Anthropology at the University of South Carolina. The vessel’s woods were conserved by slowly replacing the water in the wood cells with polyethylene glycol, a process that took more than nine years. In 1992 it was moved to the Rice Museum in Georgetown. The original Brown’s Ferry Vessel can be viewed at the Georgetown Rice Museum at 633 Front St., from 10 a.m. to 4:30 p.m. Mondays-Saturdays. Admission is $7 ages 22-59, $5 ages 60 and older, $3 ages 6-21 and free for ages 6 and younger when accompanied by an adult. The new model will be on display starting Saturday at the South Carolina Maritime Museum at 729 Front St. in Georgetown. Its operating hours are 11 a.m.-5 p.m. Mondays through Saturdays, and while admission is free, donations are appreciated.